Scientists at the National Oceanography Centre (NOC) have used advanced photographic tools in an unmanned Autonomous Underwater Vehicle (AUV) to make major advancements in estimating deep-sea ecosystem diversity at 'landscape' scales. By using a camera on the Autosub6000 AUV to take a continuous stream of high resolution photographs of life on the sea floor, this new method revealed a tenfold increase in the precision of deep sea ecosystem diversity estimates relative to the use of scientific trawling. 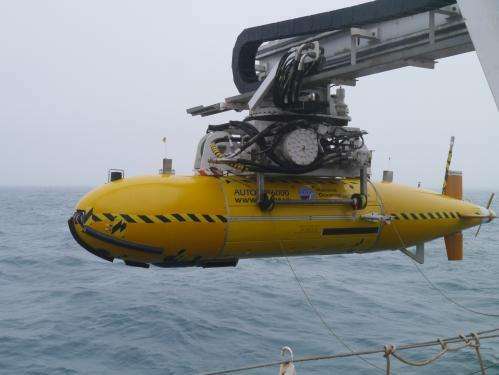 Autosub6000 was developed by the NOC as part of an ongoing project. This research showed that Anemones were the most abundant animal on the sea floor, information that has been previously missed from trawling because they became damaged in the nets and rendered unrecognisable. Dr Kirsty Morris, the lead author of this research, published in Limnology and Oceanography: Methods, said "This is an important step towards the automated imaging of the deep sea, which is essential for understanding the complexity of seafloor biodiversity and its future management"
Once the images were taken they were analysed to identify the types of creatures seen, calculate their relative abundances and estimate their size relative to the image pixels. This allows for an overall estimate of the biomass to be calculated and compared with later/earlier images in order to monitor how these ecosystems change over time. 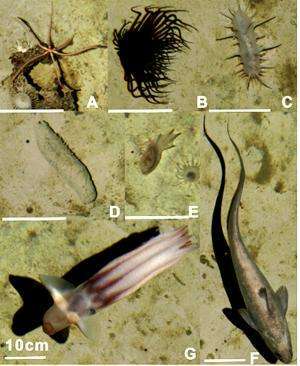 As climate change and potential exploitive pressure of seafloor resources impact the ocean, it is increasingly important to better document deep sea marine biodiversity and ecosystems. Currently trawling is one of the most common methods of assessing what creatures live in these habitats; however trawling has drawbacks in terms of poor accuracy and a bias in sampling seafloor biota. The new method, developed at the NOC, will substantially improve the accuracy and efficiency of sea floor surveying. This method was developed and tested as part of the NERC funded AESA (Autonomous Ecological Surveying of the Abyss) project. It is currently being used to map the proposed marine conservation zone, know as Haig-Fras, as well as to estimate the seafloor carbon dynamics within the vicinity. This project will involve evaluating the role of habitat and sediment type, as well as discovering which animals live there. Dr Henry Ruhl, co-ordinator of the AESA project, said "We are creating photographic maps of animals on the seafloor, which can scale up to the size of cities. This allows us to understand links between ecology, ecological functioning, and human impact in a way that was not previously feasible."